We talk with CEO Jeff Potter about the Surf Air all-you-can-fly private membership air travel club. Also, an uncontained engine failure on a BA flight, low airline fares, management changes at United, American Airlines used the wrong plane, and remotely manned towers may be on the way. 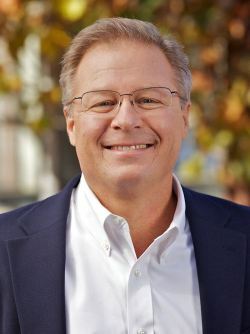 Jeff Potter is the Chief Executive Officer of Surf Air, an all-you-can-fly private membership club for business and leisure travelers. Surf Air uses Pilatus PC-12 aircraft on scheduled routes, currently from airports in California. However, the company looks to expand and provide service in other regions, even internationally. Jeff has luxury product experience as Chief Executive Officer of Exclusive Resorts. He also has an aviation background and worked his way up from airplane cleaner to President and Chief Executive Officer of Frontier Airlines, as well as being a member of their Board of Directors. Jeff was also the CEO of Vanguard Airlines for a short period. Jeff explains how the Surf Air fixed monthly fee makes the private aviation experience affordable. He characterizes it as a disruptive model that competes with commercial carriers. 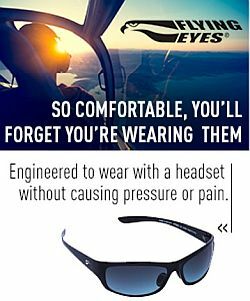 Follow Surf Air on Twitter, Facebook, and YouTube. The NTSB reports that the engine fire on takeoff at McCarran International Airport (LAS) by British Airways flight 2276, a Boeing 777 with GE90-85B engines, was an uncontained engine failure. JetBlue Airways can fly you from JFK to Chicago for $74. A holiday promotion at Delta can cost as little as $78. American Airlines has a $97 fare from Columbus to Washington Reagan. Is there an airline fare war? Jeff helps understand what’s going on. United CEO Smisek and two other executives resigned as a federal investigation is underway about the propriety of United creating a route between Newark Airport and Columbia, S.C, near where then chairman of the Port Authority of New York and New Jersey David Samson had his weekend home. An American Airlines A321 left LA for Hawaii, but it didn’t have the requisite ETOPS certification. American discovered the problem enroute and notified the FAA, but the plane continued to it’s destination. Ornskoldsvik Airport in northern Sweden has an unmanned tower. The controllers are 90 miles away at another airport watching by camera. The idea is being tested elsewhere, even at one airport in the United States. David goes fishing this week for a History Segment. He hopes to catch one of these in the wild at Joint Base Andrews for a whale of a tale. This episode we talk about The Aero Spacelines Guppies, and the lure of the aircraft that put a man on the moon. Rob Mark talks about customer service at United Airlines. The Bristol Hercules engine startup courtesy Ian. Lamont sends this photo taken in a practice area West / slightly Northwest of San Jose, California. 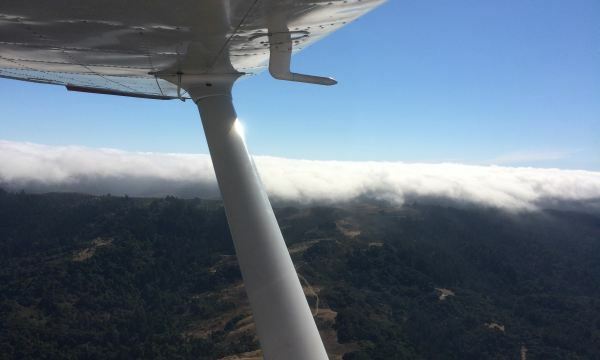 The photo shows the marine layer being held back by the Santa Cruz Mountain Range in the early afternoon. Jodi Brommer sends this shot of the smallest 777. 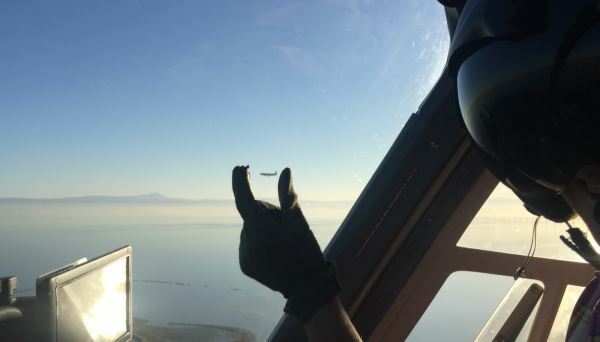 She was hanging out on the approach path of San Francisco, 2.5 miles off the touchdown markers. This entry was posted in Episodes and tagged airline fares, American Airlines, ATC, BA, incident, Pilatus, Surf Air, United Airlines on September 16, 2015 by maxflight.